So far for Senior Week, we’ve already well established that I’m a freak. Cold Han Solo, waiting in lines for hours, but this is where I go over the edge. The fact that, as a compulsive poster collector, I have more posters in my flat file than I have on my walls. So I figured it was time to give some of those posters some love. It’s important to make it clear that I have a lot of posters on my walls. A lot. Not just posters, but art of all sizes to the point where my walls are literally more art than paint. A conservative estimate would be, in my two-bedroom apartment, my fiancée and I (important note, she’s cool with this) have around 200 pieces on the walls. But that’s nothing compared to my flat file. My super messy flat file on the floor in my office, tubes Legos and Tyler Stout posters everywhere. In there I have at least 400 pieces of art ranging in sizes. Most of this stuff has already been on the wall for some time, but has been rotated out. Others are just waiting for me to get tired of the current crop and some are simply lost in the abyss of poster limbo. Here are just a few of my favorite pieces of art that I own and is sitting in a dark, flat, metal file cabinet, not on my walls. Amelie by Daniel Danger — I love this movie and I love this piece. The problem is, you want to display both parts of it (it’s two separate prints) and that’s difficult with a lack of wall space. Halloween by Methane Studios – My first real Mondo print. Still a fun representation of the movie but I have several better ones now and it also has a hole in the center because I framed it improperly. Edgar Wright Triple Bill by Alex Pardee —I rarely buy a gig poster for an event I wasn’t at but, since I did see all these movies in the theater and felt exactly like this poster looks, I figured I’d get it. Frankenstein by Drew Struzan —Legendary artist Drew Struzan’s first screenprint. It’s over 20 colors and mine is the only one I know of signed both by the artist and the man who did the lettering, Ken Taylor. I break this out pretty much every fall, but its odd size means it doesn’t have a permanent place. Hell Track by Jeff Boyes —Trust me, there are not many art prints based on one of my favorite movies as a kid, the BMX film Rad. This was the first, and the only reason it’s down now is because I had it up for about five years. Pulp Fiction Action Figures by Max Dalton —As a fan of action figures and Pulp Fiction, I’ve always loved this poster. I’ve since purchased a few other Dalton and Pulp Fiction posters. E.T. the Extra-Terrestrial (Variant) by Dan McCarthy — Probably one of the best posters for E.T. ever done, including the theatrical one-sheets. However, I have the variant edition, which is gold. I wanted the blue regular but wasn’t able to get it and for that reason, this piece has never quite made it on the wall. Jurassic Park by Kevin Tong — You’ve probably seen a hundred pieces of Jurassic Park art and posters but nothing like this. Tong’s fun what-if take on the material is a rare departure from the usual, dark, dino-filled fare. Player 2 Has Entered The Game by Aled Lewis — Aled Lewis did the first two Edgar Wright “Cornetto” films in this style and I own them both. Star Trek II: The Wrath of Khan by Tyler Stout — Tyler Stout is arguably my favorite artist and I literally have a full room only of his work. I’m sitting in int as I type this. However, the number of posters I have far surpasses the size of the room so several cool posters, like this one, came down for newer ones. The Legend of Zelda (Variant) by Olly Moss — When I first started collecting art, I dreamed of what artist Olly Moss would do on a Zelda poster. Aliens (Variant) by Ken Taylor — Aliens is another property that has a ton of different posters, but Ken Taylor’s detailed, dynamic look at the Queen is one of my favorites. The Wizard of Oz by Tom Whalen — I own a lot of work by Tom Whalen and this Wizard of Oz poster might be my favorite piece he’s ever done. And yet, it’s never been on the wall, mostly because as much as I enjoy The Wizard of Oz, it’s not an all-time favorite. I know. Sue me. The Battle at Blackwater by Mark Englert — This had been up for a good long time, right under a light that let the green glow in the dark inks really shine when the lights went out. 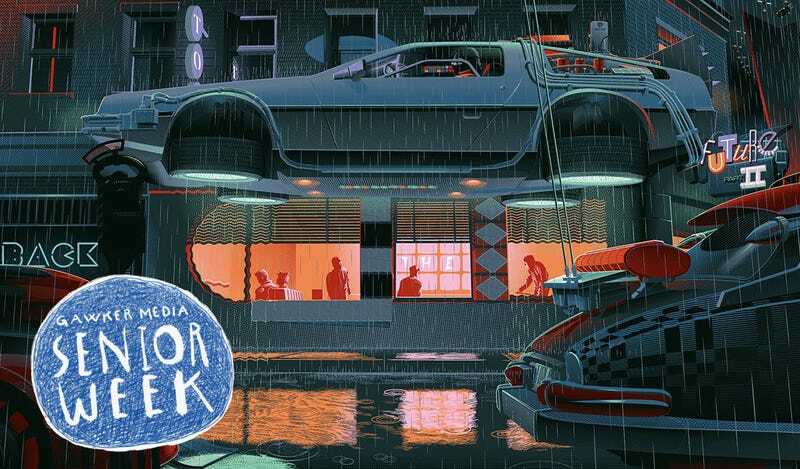 Back to the Future Part II by Laurent Durieux —There are two big problems with Back to the Future posters: None of them have the actors on it, and there are too many. This is one of three posters in the same style by Durieux, of which I own them all, but at 36 x 24 inches, they’re just too big to get all three on the wall at the same time. Han Solo by Craig Drake —Much like Tong’s Jurassic Park, this is a poster that has made it on the wall, off and back on a few times. It’s probably my favorite likeness of Harrison Ford I’ve ever seen but, as you may have read, I already have a lot of Han Solo stuff. Starship Troopers by Kilian Eng —Starship Troopers is another film that I loved growing up and doesn’t get nearly enough love in the pop culture world. Thunder Road by Matt Ferguson — Explorers. I mean, come on. Super wonderful, underrated movie and here’s a simple, clean poster for it. I even have another one to go along with it by Cuyler Smith. But, for one reason or another, this just continues to never make it to the top of the pile. The Lion King by Florey —Two is too many once again. These connecting posters by Florey are stunning and some of the best Disney art I’ve ever seen. But, when you put up as much art as I do, to get two posters for the same movie up next to each other is incredibly difficult. Miles We Go Before We Sleep by Matt Ryan Tobin — I’m a massive Blair Witch fan and this is a poster the computer screen does no justice. You can’t make out the inks that look like handprints, the fact the title is white so so you can only see it in reflection, it’s aesthetically pleasing but also incredibly creepy.